This is Flute online program. The flute is a musical instrument of the woodwind family. Unlike woodwind instruments with reeds, a flute is an aerophone or reedless wind instrument that produces its sound from the flow of air across an opening. 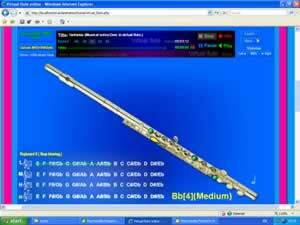 Virtual flute online is to practice playing flute on the internet. Music can be played by the fluteas a file (files.mid) upload to try to play the same. Can determine the speed of play. The training. Save the music you play as a file (files.mid) to play on your computer.